It has been ages since I first wished to see paid apps on the Egyptian Google Play store. I think this dream started to come true. What!! 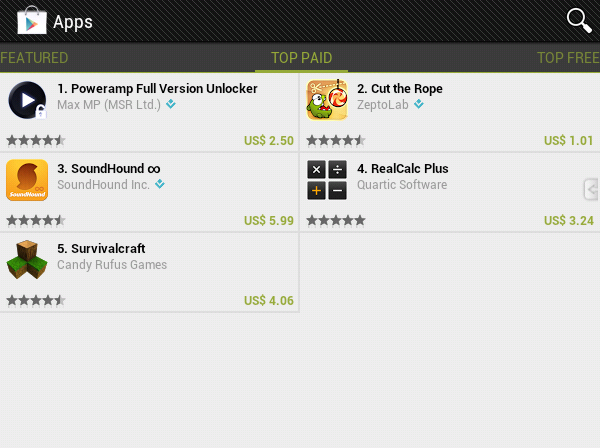 #Google play store in #egypt shows a top paid list. I can't believe it!! I tweeted this yesterday and there was a single paid app in the top paid apps list on mobile google play client. Today there are about 5 apps in this list. I hope that Google will also allow Egyptian Android developers to publish paid apps on Google play soon. Google Calculator! .. And Enjoy! Happy Birthday SMS, RIP Soon ?